Update: the promotion has ended. Thanks, everyone, for your support and help getting word out. 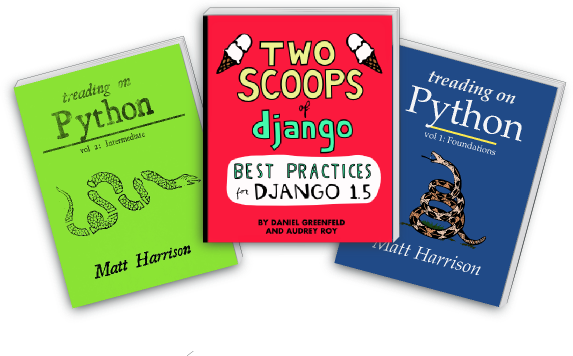 To celebrate Cyber Monday 2013, I've teamed up with Daniel Greenfeld and Matt Harrison to create the Python Indie Bundle. Treading on Python volumes 1 and 2, and Two Scoops of Django 1.5. The set of 3 books normally costs $36.95 total, but for Cyber Monday we're offering it for $24.95. You can get it from Two Scoops Press here.